Inspired by a website called “Dude, Autumn Happens Here, Too” (https://www.californiafallcolor.com/ ) I set off last week to see the quaking aspen groves in the Sierra. As I drove up Highway 4 and over Ebbetts Pass the aspen groves came into view. Markleeville and Monitor Pass displayed some nice color, too. As I enjoyed the fall display I wondered if they would be as beautiful for future generations or if our impact on the environment would cause these glorious trees to change in any way. Quaking aspen (Populua tremuloides) is the most widespread tree species in North America. They generally grow in high altitude areas but also exist at sea level in places like the state of Washington along the Pacific coast where climate conditions are ideal. Quaking aspen provide food for foraging animals and habitat for wildlife. They also act as a fuel break retaining much more water in the environment than do most conifer species. High mountain systems, such as the Sierra Nevada, are uniquely sensitive to anticipated global climate changes and act as “canaries in the coal mine” to provide early signals of significant climate-driven changes. Research in the Sierra Nevada by Pacific Southwest Research Station, a USDA Forest Service research organization, shows how vegetation has responded to climate in the past and indicates changes than might be coming in the future over the next decade. Climate has a profound influence in shaping our environment and natural resources. By looking at tree ring records of living and ancient wood and pollen lake sediments present climate can be compared to historic patterns to show climate changes. Research indicates a complex, unpredictable future for aspen in the West, where increased drought, ozone and insect outbreaks will compete with carbon dioxide fertilization and warmer soils with unknown cumulative effects. They are vulnerable in the face of climate change. Hopefully, we will not lose this wonderful tree in California. Weather conditions play a major part in the intensity of fall color. The time of year is nearly consistent but some years the show is more dramatic than others. The best conditions for intense leaf color to develop are dry sunny days followed by cool, but not freezing nights. Which plants put on the best show in our area? Here are some of my favorites. California native Western redbud turns yellow or red in the fall if conditions allow. This plant is truly a four-season plant starting in spring with magenta flowers, then leafing out with apple green heart shaped leaves. Colorful seed pods give way to fall color. This small native tree or large shrub does well as a patio tree in gardens with good drainage. Other native plants like spicebush and Western azalea turn yellow or gold in the fall. A native vine that lights up with the onset of autumn is Rogers Red California grape. If you have an arbor, wall or fence that needs covering quickly this is your plant. The green and gray leaves are transformed in autumn into great draperies of rich, scarlet leaves with clusters of summer fruit turning all shades of purple. Edibles that turn color in the fall include blueberries, pomegranate and persimmons. Trees and shrubs that do well in our area and provide fall color include Chinese flame tree, ginkgo, Idaho locust, Chinese pistache, crape myrtle, witch hazel, all maples, liquidambar, katsura, dogwood, locust, cherry, crabapple, oakleaf hydrangea, barberry and smoke tree. Never underestimate the power of nature especially that of plants. I was heartened this week to read about a study recently published by the Department of Energy’s Lawrence Berkeley Laboratory regarding the increased rate that the earth’s vegetation is absorbing human-induced CO2. When I was a kid my father used to work at the Berkeley Lab. As a welder during the 50’s I remember him coming home and tell me about working on the bevatron which was the state of the art atom-smasher being built there. The goal of Berkeley Lab which Dad used to call The Radiation Lab has always been to bring science solutions to the world. A new study published in this month’s Berkeley Lab newsletter, has found that plants are grabbing more carbon from the air than in previous decades. The study is based on extensive ground and atmospheric observations, satellite measurements of vegetation and computer modeling. Another player was identified in the study. Plant respiration, a process in which plants use oxygen and produce CO2, did not increase as quickly as photosynthesis in recent years. This is because plant respiration is sensitive to temperature. The study showed that between 2002 and 2014, plants took in more CO2 through photosynthesis but did not “exhale’ more CO2 into the atmosphere through respiration. Still I’m hopeful that the earth will heal itself if given the chance and we can thank plants including the humble houseplant for helping offset increasing levels of CO2 from fossil fuel emissions. Berkeley Lab is at the forefront of research in the world of science. Earlier this month they hosted a three day forum to study and share information about how plants transport water from their roots up through the stem and how they respond to stress such as drought. The new data will provide insight about how to better tend crops and other plants under stress and to improved understanding and forecasting for drought-related die-offs of trees and other plant species. Also in the news at Berkeley Lab is the research the lab is doing in the search for an Ebola cure. Rather than using human or lab animals, a crystal isolated from the cells of a broccoli related plant called mouse-ear cress, provided the target related protein. Researchers have used this plant as a model species for studying cell activities and genetics since the mid-1940’s and in 2000 this plant’s genome was the very first plant genome to be sequenced. Quite an honor for another humble plant. Let us be thankful for the plants we all love so much. They live in a neighborhood of traditional landscaping. Large lawns surrounded by neat mounds of boxwood and foundation plants are the norm here in the Pacific Northwest. But Bob and Bev had a different vision for their 2/3 acre corner property, They wanted fruit trees, vegetables and berries in addition to flowering shrubs, perennials and roses and they wanted to grow it organically. Bob and Bev live next door to my sister, Evan, on Fox Island. Located in the southern part of Puget Sound, the island’s weather and climate are tempered by the water that surrounds it on all sides. This is both a blessing and a curse. Strong winds, thunder, lightning and heavy rain in both the summer and winter are interspersed with idyllic sunshine and blue skies. You’d never know these challenges exist when you look at Bob and Bev’s garden. It’s spectacular. Both love being outside. Bob was raised in the midwest and Bev on the east coast. Bev confesses that long ago she was more into zinnias and petunias and “didn’t get it” when it came to real gardening. They started creating the garden about 6 years ago with Bob designing the hardscaping and laying out the original beds and recirculating stream. They told me they “take one step at a time” in the garden so it seems it’s never done. Don’t we all know that feeling? There are a lot of deer on Fox Island which has been an ongoing battle. Originally, after deer ate everything including the red-twig dogwood, roses, fruit trees and berries, Bob put up a short fence thinking it was enough of a deterrent. When that was less than successful, he surrounded the lower property where the edibles live with a 6 ft see-through fence topped with 2 wires slanting outward. “Works great”, Bob says although they have both see deer on their hind legs trying to pull down the fencing with their hooves. One time a young buck and doe got under the fence and it took several neighbors to help herd them out of the gate. Wildlife is abundant on the island. They take down the 3 bird feeders nightly as the raccoons were tearing them down and demolishing them to get to the feed. On this morning a small flock of American goldfinches were enjoying a meal, the males displaying their deep, butter yellow breasts. They often hear coyotes closeby and 3 years ago a couple of bears swam over to the island from the mainland. “Are there foxes on the island, too?, I asked. Bev laughed. “No, the island was named after a British explorer”, she told me. The most aggressive animal they have ever had was a pheasant they named Phinneus. Seems he terrorized the neighborhood last year. He would land on their fence, jump in and chase Bev around the garden pecking at her legs. It was predicted that the island would have a warm, dry summer but Bev told me it’s turned out they have been getting some rain. The strawberries are still producing as are the blueberries. The blackberries, which don’t normally ripen until August, are almost done for the season. “Climate change?”, Bev theorized. 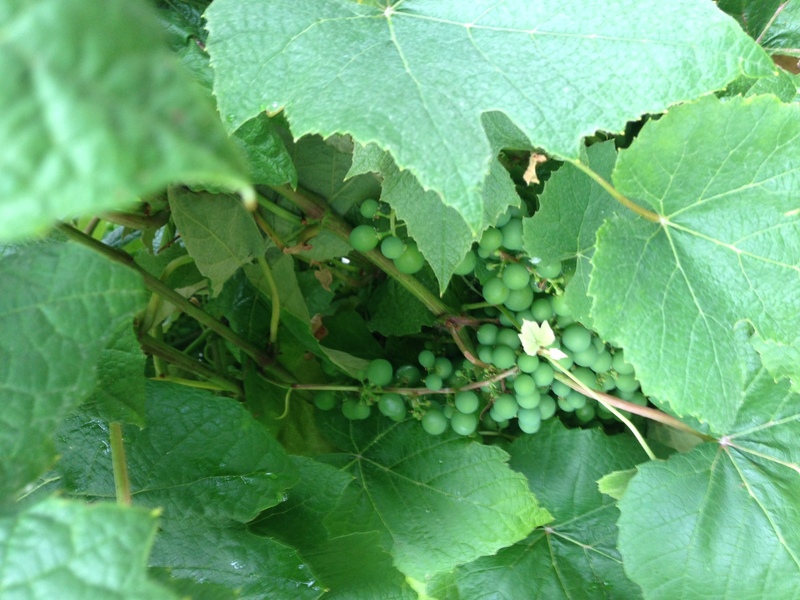 Bob and Bev’s grapes were still green but coming along nicely. 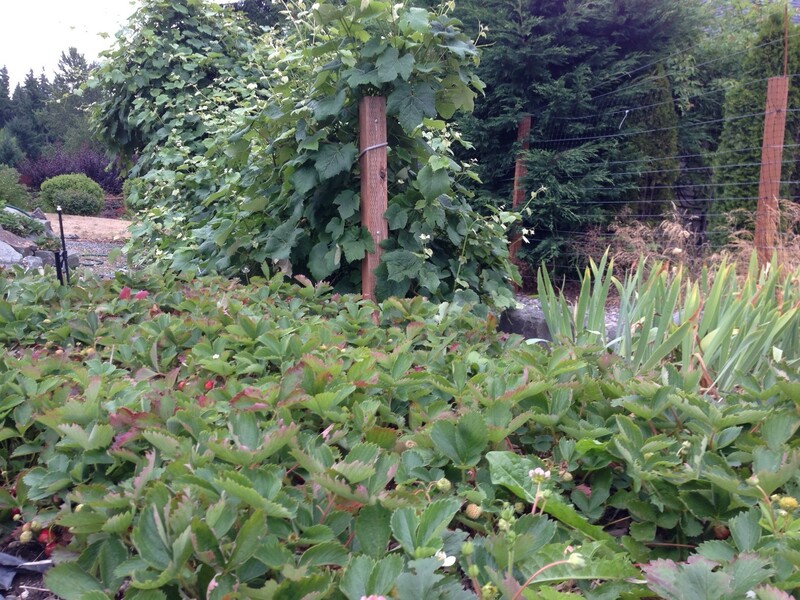 They grow a concord-type grape and have good harvests in mid-September now that they allow the leaves to cover the clusters and hide them from the birds. The main vegetable garden is fenced to protect it from Delia, the dog, who loves to eat carrots right from the ground as well as some of the other vegetables. 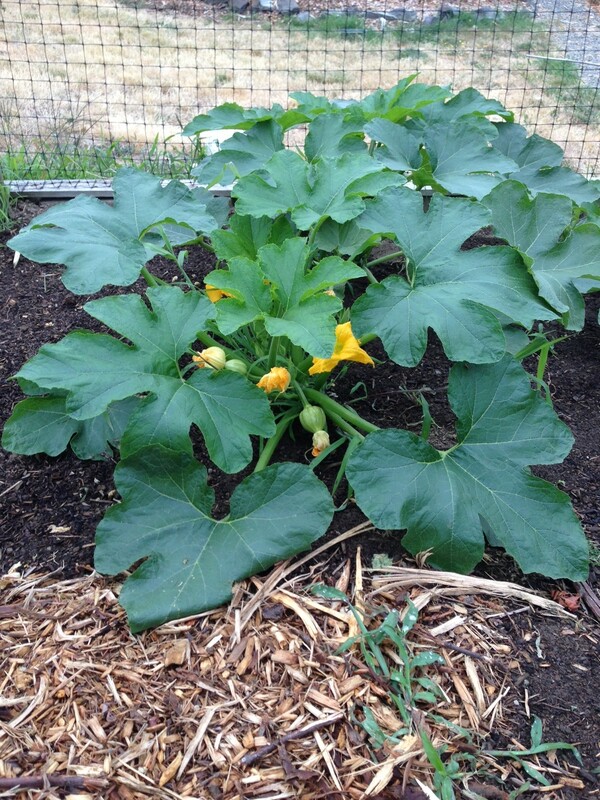 The acorn squash are growing nicely and new rows of beans have been planted and fertilized with worm casting juice. With so much to see in this garden my head was spinning. The stories just kept coming about the successes and methods they have worked out to provide food for the soul as well as the table. Next week I’ll tell you more about this wonderful garden on Fox island. Seems like I "Google" something nearly everyday. I can barely remember what life was like before the information highway. For subjects like gardening however information from your own neck of the woods is the best. Locals have knowledge of weather patterns, plant behavior, pests and diseases, flowering sequences- you name it – there's a neighbor or friend or local expert who can help you. I'm fortunate in that lots of people ask questions of The Mountain Gardener about gardening here in our unique part of planet earth. Here are some recent inquiries. You might be wondering about the same things. We all rely on Sunset's Western Garden Book as the bible for gardeners. With each new edition I eagerly look to see if they've figured out that Felton is not in zone 7. Sure it was pretty cold around here in January but even with climate change the San Lorenzo and Scotts Valleys are not as cold as a zone 7. Even considering microclimates we can grow a wide variety of plants that would not survive in the Sierra foothills, the Gabilan range, the Coast range or other zone 7 areas. Wish they would ask local nurseries and knowledgeable horticulturists what the weather is really like here. Knowing the climate in your area helps determine what you can grow in your garden. It's confusing to both new and seasoned gardeners alike. Here are some tips to help you determine in what zone you garden. Zone 7 has the coldest winters in our area. Very high ridge tops like the Summit area and the most northern portions of Bonny Doon lie in this zone. My records show average winter lows ranging from 15-25 degrees based on 20 years of input from gardeners in these areas. This does not apply to other areas of zone 7, just those around here. 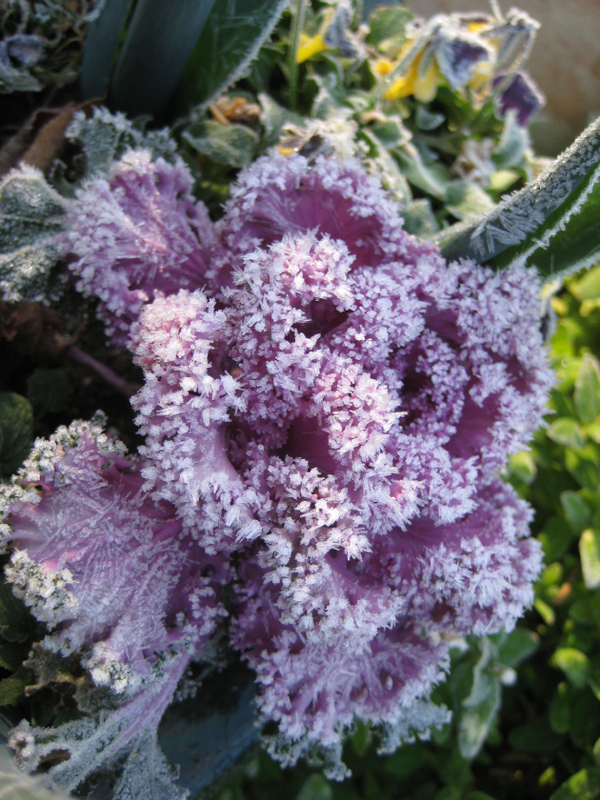 Record lows have occurred during freezes in 1990, 1996 and 2007 but as gardeners we rely on average highs and lows to help guide our planting times. Spring weather comes later in this zone with the growing season mainly from April – October. Zone 15 encompasses most of our area. Winter lows average 20-30 degrees. The valley floor of both San Lorenzo and Scotts Valley lie in this zone and are what I call "a cold 15". Cold air sinks and is trapped in these areas. Often there is damage to the tips of oleanders and citrus while gardenias and tropical hibiscus need a lot of extra protection.There are warmer parts of this zone, though, where the growing season starts in March and ends in November. These areas rarely get a freeze after March 15th or before Thanksgiving. Zone 16 – those who live up off the valley floor but below ridge tops live in this "banana belt". Pasatiempo also falls in this thermal zone. Light frost can occur during the winter but mostly the winter lows in this zone stay near or above freezing. You might have cold pockets on your property however so plan accordingly. Some gardening tasks are dependent on the weather. Many shrubs,perennials and grasses are to be pruned after danger of frost is past and many vegetables should be started after this time as well. As a reminder the estimated date of our last hard frost is March 15th. I've kept a weather journal for my area, the San Lorenzo valley, since 1992. Based on my records, we may get a few frosts, especially after a storm, in late March or early April but for the most part, we have mostly passed the chance of having a heavy frost. Still it's a good idea to have a cardboard box or blanket ready to protect your young seedlings. I hope this helps in choosing plants that will thrive in your garden. On the eastern side of the Sierra, ribbons of brilliant gold flow down the mountainside. The color can be seen from miles away. Meadows spread wide covered with vivid yellow-leafed Aspen quaking in a fall breeze. It's the height of the fall foliage season in this part of California. As I drove down Hwy 89 south of Lake Tahoe past Markleeville and then over Monitor Pass to Hwy 395 each stand of aspen seemed to glow brighter than the last. I wondered if they would be as beautiful for future generations or if our impact on the environment would cause these glorious trees to change in any way. Quaking aspen (Populua tremuloides) is the most widespread tree species in North America. It provides food for foraging animals and habitat for wildlife. It also acts as a fuel break and retains much more water in the environment than do most conifer species. High mountain systems, such as the Sierra Nevada, are uniquely sensitive to anticipated global climate changes and act as canaries in the coal mine to provide early signals of significant climate-driven changes. Research in the Sierra Nevada by Pacific Southwest Research Station, which is a USDA Forest Service research organization, shows how vegetation has responded to climate in the past and indicates changes than might be coming in the future over the next decade. Climate has a profound influence in shaping our environment and natural resources. By looking at tree-ring records of living and ancient wood and pollen lake sediments present climate can be compared to these historic patterns to show climate changes. Research indicates a complex, unpredictable future for aspen in the West, where increased drought, ozone and insect outbreaks will compete with carbon dioxide fertilization and warmer soils, with unknown cumulative effects. Aspen are valuable in providing moisture in the landscape and habitat and food for wildlife. They are vulnerable in the face of global warming and climate change. Hopefully, we will not lose this wonderful tree in California. If you're from a part of the country where these trees are native and you miss their fall color there is a new cultivar of Improved Quaking Aspen developed for mild winter areas like ours. It provides a splash of color for areas that are naturally moist like a natural stream or a high water table. They grow 20-30 feet tall and 15 feet wide and spread by underground roots to form a stand.